I went to IMDb.com (that would be the Internet Movie Database) to do some research on the television series “Bones”. When I said do research on “Bones”, I meant doing research on the actress Emily Deschanel. But that’s another story. Holy…. it’s a giant baby! A sequel to the 1992 movie “Honey I Blew Up the Kid”! I love that movie by the way. It’s a kid thing. Well, I realized it wasn’t a sequel when I saw the title of the movie, which is “Babies” and read the description of the movie. Basically “Babies” is a movie that follows the lives of four babies from around the world for one year. More information can be found here: http://www.imdb.com/title/tt1020938/. While the concept is certainly very interesting, I can’t understand who would pay to watch a movie based on the lives of four babies unless they are either people studying psychology (what I used to study), anthropology (studying that next semester), education (my future career?) or anything else relating to children. Or probably people that love babies. But you can’t deny that the still shot is quite a piece of work. 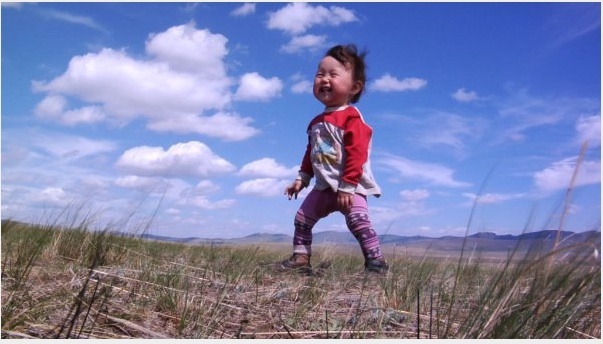 The Mongolian baby does looks very happy. On an entirely different topic, since I realized I haven’t been posting up my favourite current music or songs, I’ll start doing it again. It also featured a certain Mr. Woods before all the … well you know. Now if you excuse me, I have to get back to my “Bones” marathon watching.